The 11th of November is San Martino’s Day and marks the time when “il mosto diventa vino” – the grape must becomes wine. It is when the fresh young wine from this season’s harvest is opened and tasted. Traditionally, the vino novello is accompanied by roast chestnuts as well as other delicious local dishes such as grilled sausages and pittule leccesi which are basically small balls of fried dough dressed with many different toppings including tomatoes, olives and capers. 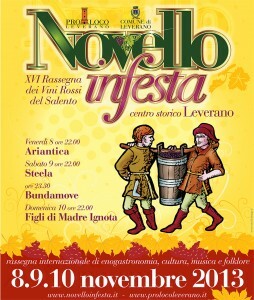 The three days leading up to San Martino Day are celebrated this year with a festa in Leverano.